In the beginning, as the worlds were wove through the planal loom, there remained many strands of kindness. These remaining strands of pure good formed together to become the Sweater of Wholesemity, an artifact capable of turning any creature good. 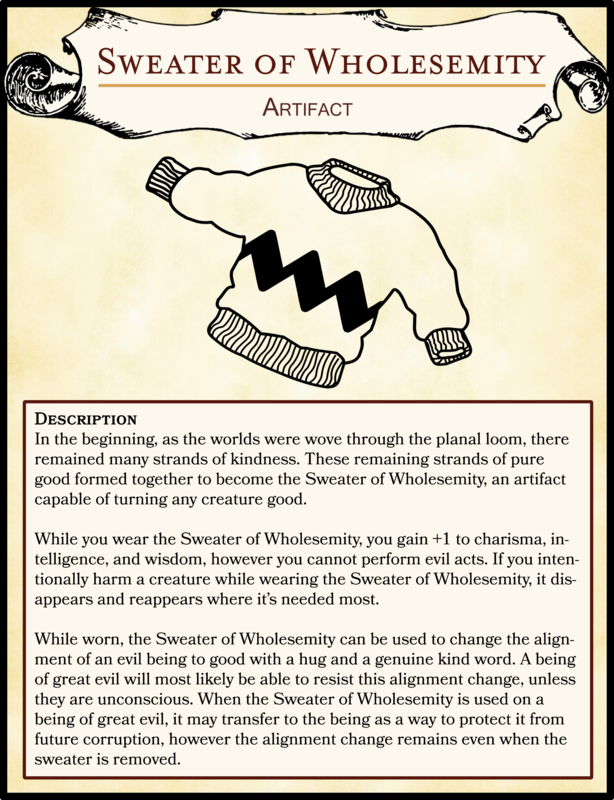 While you wear the Sweater of Wholesemity, you gain +1 to charisma, intelligence, and wisdom, however you cannot perform evil acts. If you intentionally harm a creature while wearing the Sweater of Wholesemity, it disappears and reappears where it’s needed most. While worn, the Sweater of Wholesemity can be used to change the alignment of an evil being to good with a hug and a genuine kind word. A being of great evil will most likely be able to resist this alignment change, unless they are unconscious. When the Sweater of Wholesemity is used on a being of great evil, it may transfer to the being as a way to protect it from future corruption, however the alignment change remains even when the sweater is removed.